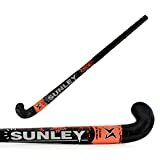 Top 10 Best Hockey Sticks in India 2019 - Top 10 In India - Only The Best of everything! LATEST product list, updates regularly! Hockey is India's National Game, and traditionally India has been one of the world's best teams. right from the time of Dhyan Chand to today, the Indian Men's and Women's hockey teams have performed very well. Playing hockey is a passion and also a matter of pride. 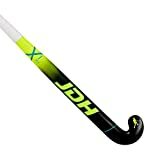 If you play hockey, then you are on the right page to find some great information of the best hockey sticks available to buy online in India and also about choosing the right hockey stick for your self. There is a list of the Top 10 Best Hockey Sticks in India a little further down the page. This list automatically updated to reflect the every latest bestsellers in India. They feature the most selling hockey stick sin India today. These hockey sticks may not necessarily be the best championship stick available to buy for hockey professionals, but they are the most popular. That means you will get a great hockey stick at a great price. These are reliable and worthwhile hockey sticks for you to choose from. They also make a great starting point for you to reach your ultimate hockey stick. 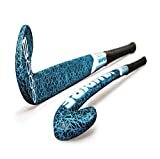 Hockey is one of the most popular sports in India, If you like playing hockey then you will find this list of Top 10 Best Hockey sticks in India very useful. To help you further here are some points on how to choose the best hockey stick for yourself. 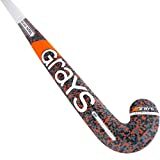 The main points that you need to consider before buying a hockey stick are, the length of the hockey stick, the weight, the material of the hockey stick, the bend (also called bow) of the hockey stick and the skill level the hockey stick is meant for. When you make a good choice based on these factors, then the hockey stick will add to your hockey playing abilities and improve your game. The length of a hockey stick ranges from 28 inches to about 38 inches. The thumb rule for a hockey stick is that it should reach up to the top of your thigh bone. If you are a defensive or mid field hockey player, then you should go in for slightly longer stick, so that you can drive the ball further and harder. If you are an offensive player than you can go in for a slightly shorter stick so that you can have better handling and control when you dribble and play. For someone who is under 4 feet in height, you can choose a hockey stick that is around 28 inches in length. If you are around 4 feet and 5 inches then go in for a stick that is about 32 inches in length. If you are 5 feet tall then the stick of length 34 inches will be fine. If you are around 5 feet 6 inches then a stick length of 36 inches will be best suited for you. If you are taller than 5 feet and 10 inches then go in for a 37 inches and longer hockey stick. Go in for a light stick if you want fast and quick wrist movements while controlling the ball. Choose a heavier stick if you want more power behind your hits and drives. The weight of hockey sticks range from 530 grams to 560 grams, and though everyone has a personal preference for the weight, you need to decided whether you want more ease of control with a lighter stick or more power with a heavier stick. In most cases you get to know what skill level the hockey stick is meant for. A beginner level stick will be of a lower cost and will be best for basic playing and learning. A professional level hockey stick will be more expensive and will be very precisely and carefully crafted with the best material to give the best control, power and maneuverability that you need. The more advanced hiockey sticks have more carbon content in them making them more precise and strong and durable. Usually the sticks are marked beginner, intermediate, advanced and professional. Usually hockey sticks are made from these three main materials. The composition of the hockey stick creates a different characteristic in them. Having more of carbon will make your hockey stick powerful and strong. Having more fiberglass will add durability and internal strength and power. Wood is the softest of the three materials and makes the stick more versatile, and you will not need a very degree of skill to play with it. The bow or the bend of a hockey stick is the curve of the hockey stick where it from the top handle to the toe at the bottom. You need to consider the bow, as less bend means better stick control and less lift, while more bend means it will help when playing scoops and aerial hits. Usually the bend of a hockey stick is classified as Regular, Control and Late bow or bend. SnS Madman 3000 Composite Hockey Stick - 37"
Assists in better ball-control, aerial game and drag-flicking.